It is no coincidence that Federico Garcia Lorca was one of the first people arrested and murdered by the fascists at the beginning of the Spanish Civil War: He was an advocate for the poor, he was gay, and he insisted that art deal with the human condition in all its imperfections—the type of honesty feared by those who worship power, wealth, and pseudo-religious orthodoxy. Today, Lorca is considered one of Spain's greatest poets and dramatists, while his detractors have been relegated to the long list of deposed repressive regimes once supported by U.S. imperialism. What sustains Lorca's reputation is the lyrical, imaginative, and, at times, profoundly disturbing nature of his work. His subjects ranged from the purely romantic to the intensely socio-political. In The House of Bernarda Alba, now in production by the fledgling Arcos Azules Theatre Company, Lorca applies classic Greek dynamics to the story of a matriarch whose tragic flaw leads to the destruction of what she is trying so ruthlessly to protect. In telling the tale, Lorca, like Cervantes before him, calls upon the rich cultural influences of the Andalusian region to create a strong sense of place. Director Janine Ann Kehlenbach marshals strong craft work—in Alexander J. Abeyta's plaintive classical, Flamenco, and Spanish Romance guitar solos, Susan Crabtree's striking set, and Kris Hipps' exquisite period costumes—to evoke the austere and stultifying atmosphere of early 20th Century Spain. Margaret Casart is Bernarda Alaba, a widow who rules over her five daughters and household servants with an iron fist, and who uses her money and knee-jerk Catholicism to forge a sense of unworthiness in everyone she contacts. Casart is chilling in her black Spanish lace mourning dress; by sheer power of her characterization, she enervates every scene she inhabits. In her scenes with Nita Froelich—playing Poncia, Bernarda's most trusted servant—Cosart is even capable of getting us to believe Bernarda's motives may not be as self-serving as we first thought. 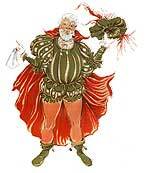 This is a tribute to Froelich's portrayal as well, drawing Poncia with the easy-going wisdom of a trusted confidant. But Poncia's good advice just rolls of the back of Bernarda, who, when all is said and done, is too arrogant consider another's perspective, thus laying the groundwork for her own fall. This leaves the unfulfilled dreams of the household bound up with Bernarda's mother Maria Josefa, the lunatic-fool-soothsayer who, gossamer-like, spins an ethereal cocoon of allusions and long-suppressed desires. Pat Goodman carries off these demanding solo dances with aplomb, providing comic relief from the oppressive constraints of Bernarda's self-imposed nunnery. After this however, things begin to get murky, with the daughters being unevenly matched in technique, leading to frustrating interactions that are difficult to understand both literally and figuratively, muting the dynamic contrast that Lorca intends between the girls and their mother. So, despite some very compelling elements, the production fails to convert a strong script into the tragedy it is capable of being. 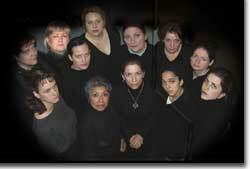 Arcos Azules' The House of Bernarda Alba runs through May 29th at the Federal Theatre. 303-571-0901.